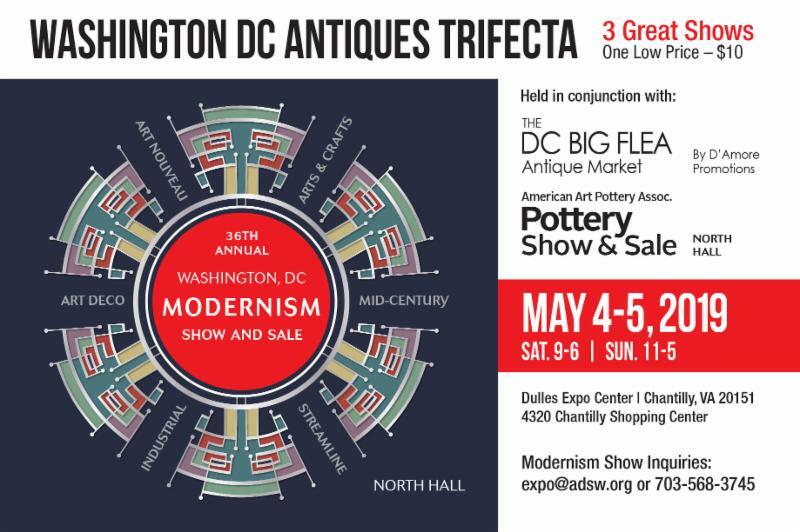 The 2019 Modernism Show and Sale will be held May 4-5, 2019 at the Dulles Expo Center in Chantilly, Virginia with the DC Big Flea and the American Art Pottery Association's Pottery Show Y Sale! The 2019 Washington Modernism Show will be held Saturday May 4th & Sunday May 5th in the North Hall of the Dulles Expo Center. Joining ADSW in the North Hall will be the American Art Pottery Association's annual show. The DC Big Flea will be in the South Hall. The three shows will be jointly promoted as an "antiques trifecta." One admission will be good for all three shows and for both days. ADSW and AAPA will also hold an Early Buyers Preview Friday evening from 6 PM to 8 PM. The FREE preview will be restricted to AAPA convention attendees and Art Deco Society of Washington members and no tickets will be sold at the door. Members of the Art Deco Society of Virginia, the Art Deco Society of New York, and North Carolina Modernist Houses are invited to attend as guests of ADSW. Advanced reservations for the preview will be available in mid-March. The Big Flea will not be open during the early buyers period. AAPA will be holding its annual convention at the adjoining Holiday Inn. The convention includes lectures, tours, an auction, and a banquet. Watch Things to Come for additional information on the AAPA convention. Dealer contracts for the Washington Modernism Show are now available. View the floorplan.Showcards and posters are now available. Send an email to expo@adsw.org to request a supply of cards and posters. Note that the preview will shorten setup Friday by 2 hours so plan to arrive early. You can also support ADSW by taking an ad in the Modernism Show program. Ad prices range from $50 for a business card ad to $350 for a full page ad on the rear cover. All ads are full color and will appear both in the print program and distributed in digital form through the ADSW website, Facebook, and Streamlines. Request an advertising guide.